Eugenie Markham is a badass. She's a sort of hermitized badass, but when you're introduced to the world of shamanism and banishing Otherworldly creatures from adolescence, regular life just seems a little…out of your element. 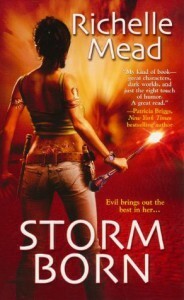 In Storm Born, Richelle Mead introduces us to a world hidden behind the one we know. Demons, spirits, faeries (or gentry), shape shifters… you get the idea… Eugenie is a major player in this world, mostly feared by all these creatures as she banishes them back to their own world or worse - to the Underworld - their own personal hell. Things get a little personal, though, when Eugenie comes across more than one Otherworldly creature that knows her by her real name and makes more than one perverse attempt to get into her pants. What? How? Why? Creepy, yes, but Eugenie has yet to discover many truths about herself, especially when it comes to her ties to the Otherworld and these… forceful flirtations… lead her to a past that she had no idea existed. A history that puts her at odds with herself and everything she's always believed. Richelle Mead has a simple, straightforward, and hilarious writing style as well as a talent for world and character building. You can see, feel, and relate to the characters as well as envision the complexities of this whole other world that is created from Mead's imagination. All in all, definitely not a bad way to kick off a new year of reading.